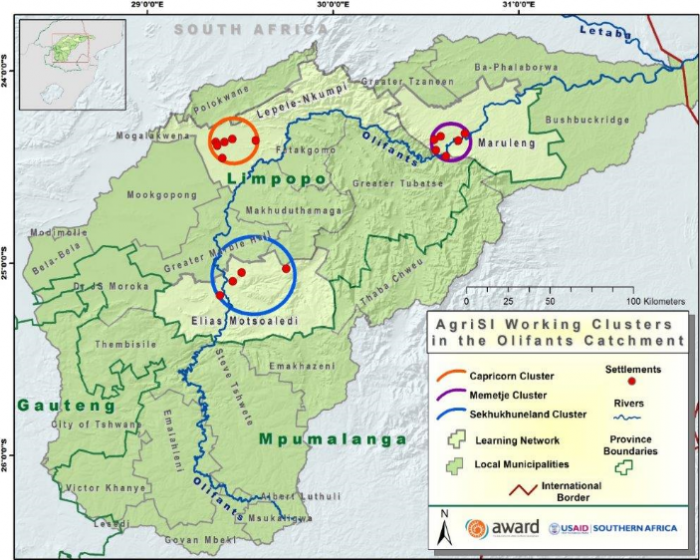 This project’s main objective is to support increased capacity, agency and resilience of smallholder farmers in targeted communities in the middle and lower catchments of the Olifants River. These farmers face multiple challenges including climate change. The project will be implemented in Sekhukhune, Capricorn and Mopani districts of Limpopo province, all lying within the middle and lower Olifants river sub-catchment. The project will, over a three-year period (2018-2021) reach 14 villages, directly benefiting 300 smallholder farmers but also indirectly benefiting close to 2000 people. To date the project has managed to create and support a number of networks for learning and sharing. Notably we have established the Smallholder Farmers’ Network, connecting and supporting cross-learning amongst smallholder farmers in Capricorn, Mopani and Sekhukhune districts, Youth in Agroecology Network connecting more than 60 youth who are practising agroecology and the ClimateSsmart Agroecology Network, bringing together organisations with an interest in agroecology and working with smallholder farmers. More recently farmers have been involved in key discussions around two proposed Seed Bills which have dramatic implications for small-scale farmers (see Box). South Africa is about to pass into Law the amended “Plant Improvement Act 53 of 1976 (PIA) and Plant Breeders’ Rights Act 15 of 1976 (PBRA). The two are commonly being referred to as the “Seed Bills”. The country is also about to accede to two international treaties namely, International Treaty on Plant Genetic Resources for Food and Agriculture (commonly called the International Treaty), and the 1991 Convention of International Union for the Protection of New Plant Varieties (UPOV). It is against the above worrisome context that AWARD is collaborating with Legal Resources Centre (LRC) and African Centre for Biodiversity (ACBio) to raise awareness, and mobilise smallholder farmers to advocate for their rights to food and seed systems as enshrined in the Constitution of South Africa. Even when the Seed Bills are passed there is room to engage with government to make sure that the regulations to be drafted are conscious of protecting the rights of smallholder farmers to save, use, exchange and sell farm-saved seeds in South Africa. This work is being supported through DKA (Katholische Jungschar Österreichs – Hilfswerk Dreikönigsaktion – Austria https://www.dka.at/).